I really wish the weather would make its mind up. Friday was wet, windy and very cold. Yesterday was warm-ish when the sun came out, but a little chilly when it hid behind the rather large clouds. Today has been gloriously hot and sunny with hardly a cloud in the sky! Today has been a garden day. We went out before Gordon left for work this morning and finished the kids digging/mud kitchen area. I am really pleased with how it has turned out and it has made the end of the garden look much tidier, which is strange as all we have done is create a patch of mud and put a couple of paving slabs down! As soon as it was finished and I got the “kitchen” out, the kids were keen to get started. 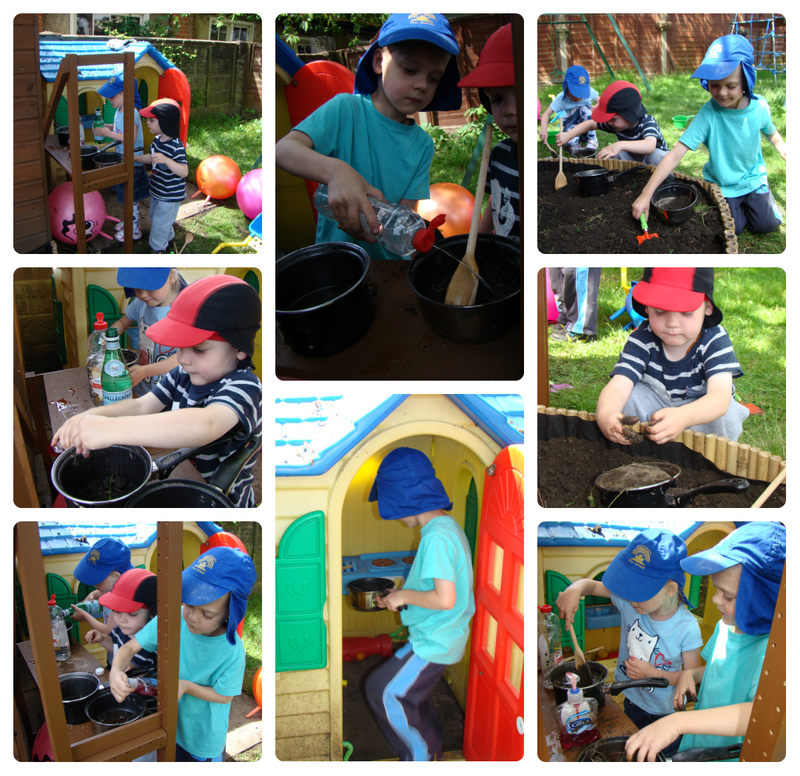 We had to hunt down the pans and spoons but they were found in the sandpit – of course! I got the Yeominis tools out and filled a couple of squeezy bottles with water. The kitchen was open for business! The big 2 started by putting mud in their pan and adding a little water. I suggested they could collect some flowers and add those too, which they did. They took their pans into the playhouse to “set” the pie on the cooker before bringing them outside and transferring it into a bowl. Ben, on the other hand, put a little bit of mud in his pan and added a lot of water! As he was trying to carry his pan around it was slopping out everywhere, so I did ask him to tip some of the water out and add more mud! Mud Pie making kept the kids happy and occupied all morning. There was lots of talk of cooking, stirring and mixing. The bottles of water became vinegar and ginger (?? ), the cooker was used to “cook” and “set” the pies. The boys were covered in mud by the time they’d finished but somehow Jasmine had remained quite clean! I thought they would go back to the same activity after lunch but actually they didn’t. The mud pies they made in the morning were left out to “dry” and the kids played in the sand pit, on the slide, with bubbles and on their bikes. When I went to tidy up at the end of the day the pies were still there, and still very very wet! I think maybe next time we won’t need to add water at all as the mud is already wet enough! The other thing I was asked today was if they could wash the playhouse. We do usually give it a quick wash in the spring so I said they could but then time ran away from us and we never got round to it in the end. I think that will be tomorrows job, assuming the weather doesn’t change its mind again and pour with rain – again!